Following the French Revolution in the so-called Age of Reason, the western world became preoccupied with self examination. 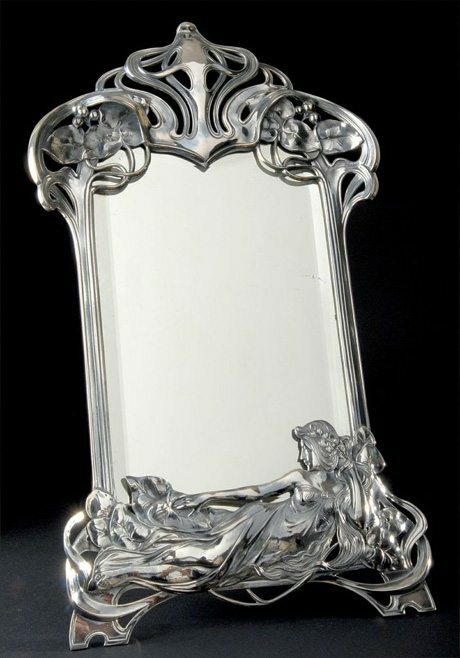 The now popular multiple mirrors reflected with merciless clarity the world, which amused or intrigued. Reflecting light became an obsession via glass inset on the walls and hanging from the ceiling. At London by 1800 the population passed the million mark and the provincial industrial cities, although growing fast, were all under a 100,000 people. The British Navy controlled the seaways; industry was flourishing; the new manufacturing class was prospering. Sense and sensibility also prevailed and politeness was valued. There was a distinct elevation of interior sentiment, feelings of the heart and the value of intimacy. The city’s environment was being reshaped, new streets, squares with open vistas and clear classical lines that were pleasing to the eye and included a variety of public and private gardens where the fashionable paraded relentlessly. Dinner parties were now frequent and rarely on a small scale, and on many occasions must have been magnificent. 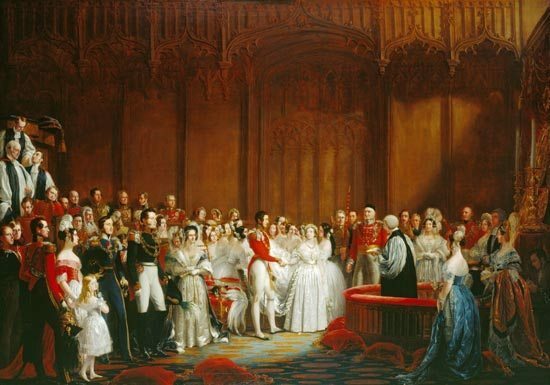 A Ball and supper were held once a week during the season at Almacks, which was severely exclusive and despotically controlled by a group of patronesses such as the Ladies Castlereagh, Jersey and Cowper. Persons engaged in commerce had no hope of attending. One night even the great Duke of Wellington, who was wearing trousers, was firmly refused admittance. Following the French Revolution in France men’s costume became severely elegant, the coat with a high turned down collar, often lined in a second colour, the breeches reaching to below the knee; with shoes and boots gaining pointed toes. Full cravats were wound several times around the neck. They were worn by such dashing gallants as Mme. 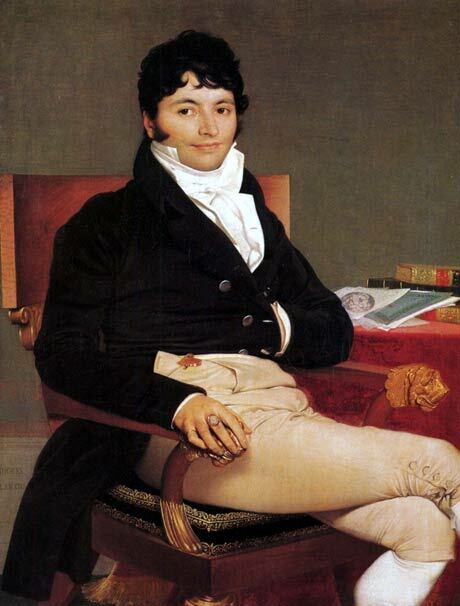 Recamier’s friend for whom she had a great tendre, Francois Rene Vicomte de Chateaubriand, French writer and statesman. Girls new to the fashionable world suffered and wept openly if they were not on the list at Almack’s. Wearing jewellery in either London or France following the French Revolution was a reminder of what had happened to the inheritors of the Ancien Regime, and for a while it went out of fashion. An enormous quantity was remounted abroad or sold for survival including the French crown jewels, which were the subject of a very daring robbery in 1792. A return to normality only followed after the establishment of the Directorate in Paris. The feminine ideal was to emulate the classical purity of Greek statues; dresses were of flimsy material, dampened to cling revealingly to the body. High waisted and free from any unnecessary ornament, which might detract attention, these tunics, inspired by Greek and Roman antiquity favored colours such as yellow, white, lilac and pistachio green. The Merveilleuses as these ladies were known, were the talk of Paris among their members the divine Mme. Recamier (pictured), Mme. Tallien, Mme. Hamelin, Mille Georges and Mille Lange. Two of them dared to walk down the Champs Elyssess in October 1798 almost naked wearing only gauze sheaths. Emperor Napoleon entirely disapproved of this type of behavior. Mme. Theresa Tallien and two of her friends appeared as nymph huntresses, clad only in light tunics that reached barely to the knees with bare feet adorned with rings in light sandals with purple straps. 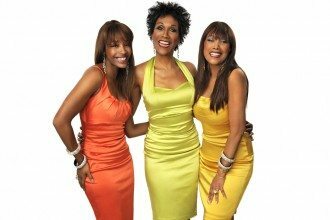 Napoleon declared that ‘the time of fable was over and the reign of history had begun’ and his two Empresses Josephine and Marie Louise, would never fit that mould. The ideal jewel was the one that complemented the new high waisted opaque dresses with puffed sleeves that enhanced the feminine form. However it had to be simple, geometric and flat. Until the beginning of the nineteenth century gemstones were always mounted in closed settings, which did not allow light to pass through the stones from the back. This type of setting meant that jewellers could enhance, match and modify the colour of the stones by means of coloured foils placed between the mount and the back of the gems. 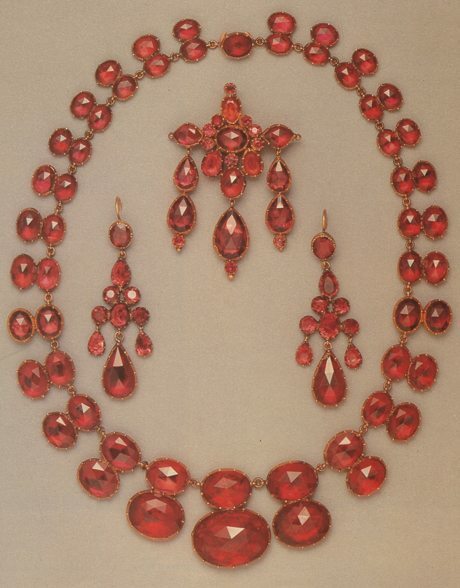 An extraordinary suite of garnets dates from the late 18th century, and the stones are rose cut. An unusual material for jewellery in the first years of the 19th century was steel, cut and polished as a precious stone. The technique of cut steel originated in England as a substitute for the more expensive. The coming to power of Napoleon dramatically changed, not only the political and social scene, but also the world of costume. He recovered most of the crown jewels and Josephine wore them during an official visit to Belgium when he was first consul. 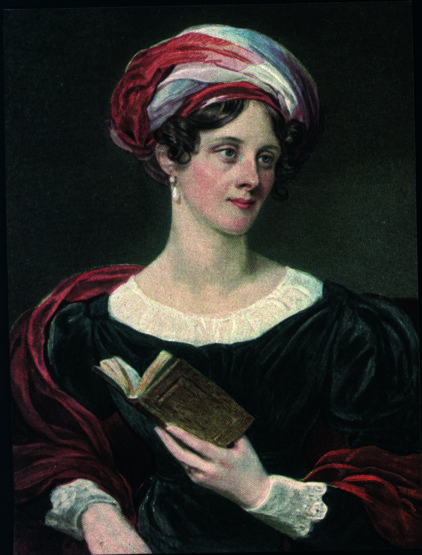 Her taste guided Parisian jewellers and on state occasions precious parures became popular once more. 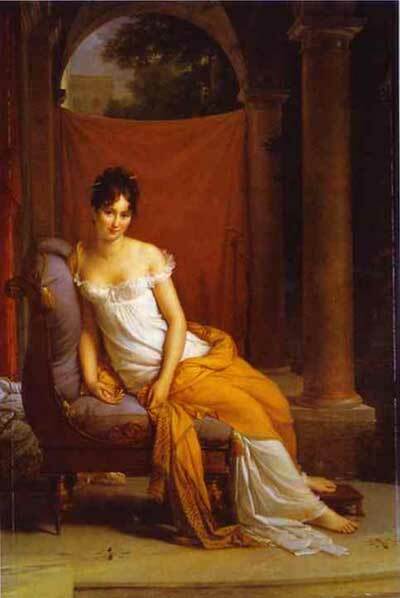 Sweden and Spain were quick to adopt the high waisted richly embroidered gowns worn at Napoleon’s court. The fashion for cameos and intaglios began soon after Napoleon’s Italian campaign of 1796 when cameos were brought back to France from Italy. Many of these were of Greek or Roman origin. Their beauty and perfection fascinated Napoleon even had some mounted for himself and he gave many away as gifts. 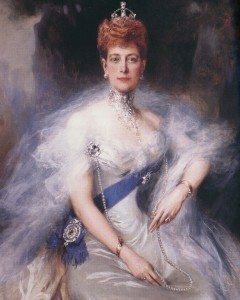 Josephine had many cameos fashioned into jewelled settings and always took her jewellery with her wherever she travelled she helped to disseminate the Empire taste abroad. 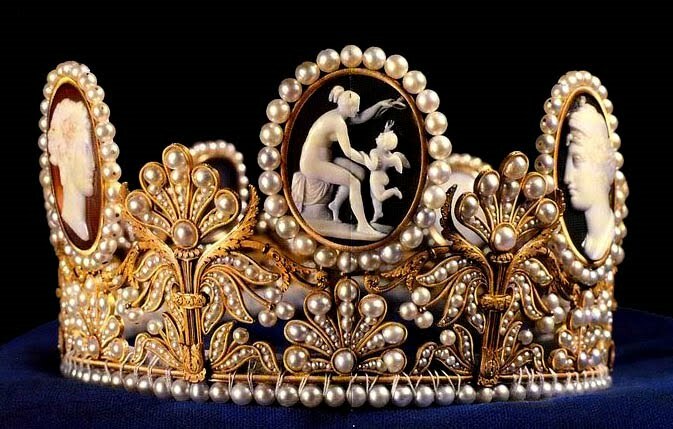 Her stunning cameo diadem was made of gold, shell, mother of pearl, cameos, pearls and precious and semi precious stones and was very special. 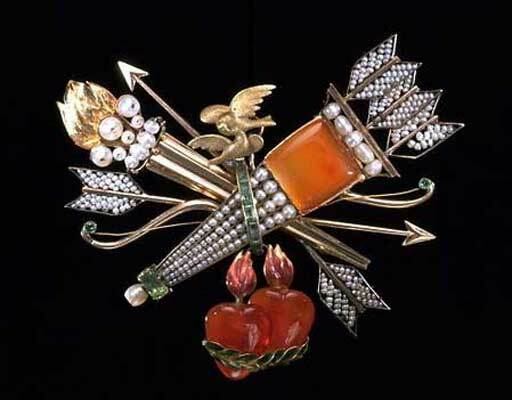 Napoleon promoted the foundation of a school of gem engraving in Paris were fine workmanship was established, occasionally in precious stones like emerald, more often in hard and semi precious stones, such as agate, cornelian, jasper and, to satisfy the lower end of the market also in modestly priced shell. 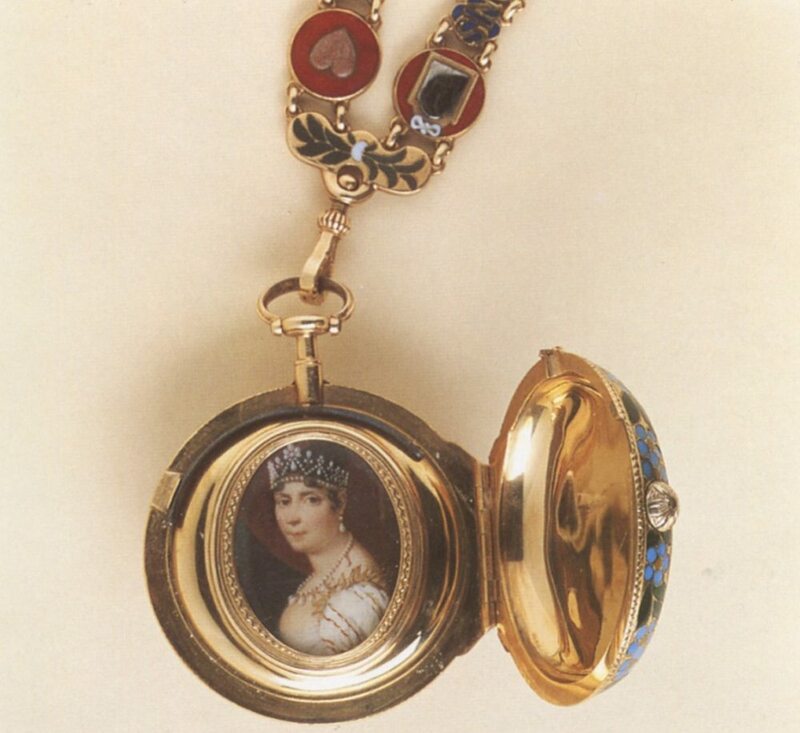 Josephine commissioned a gold watch and fob for Napoleon as a celebration of their love. The watch case is decorated with doves of Venus perched on a garlanded quiver of arrows, bordered by triumphal laurels and forget me nots. Circular plaques bear symbols of the virtues on quatrefoil links the heart tender, mirror truthful, dog faithful, the padlock secret, the flaming altar passionate and the tower, constant. The reverse, decorated with forget me nots and laurels, displays Cupid’s arrows and lamp of love. A pair of seals is attached one decorated with the first lovers Adam and Eve, the other with an owl in a cage, emblematic of love’s dominion over wisdom. The watch key in the form of a butterfly is a symbol of the soul, an allusion to time flying but love remaining. The watch opens to reveal a portrait of Josephine by Jean Baptiste Isabey. 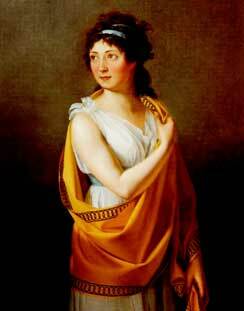 The vogue for neoclassical architecture affected the designs of costume. The imitation of the antique in its spirit, principles and maxims, which French architects to Napoleon Percier and Fontaine declared belonged to all times. 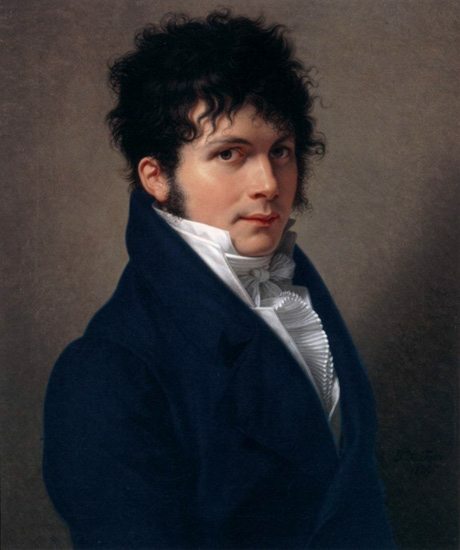 Napoleon revived the royal cravat with a small lace trimmed collar and cascades of Alcenon lace. A fashion also taken up by women, particularly in Russia where ladies who wore it were at the height of fashion and style. Tying the cravat in complicated knots gave rise to the fame of the dashing Dandy Beau Brummell. 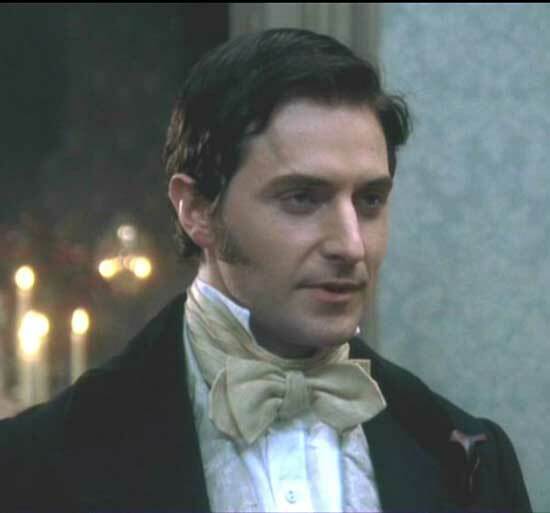 He made cravat tying one of the main preoccupations of Dandies who turned all their attention to accessories. He grouped himself around the Prince Regent and gradually imposed the new style of men’s clothing, typified by studied correctness and impeccable fitting which led English tailors to perfect cut as well as attention to smallest detail. For men one of the 18th century’s greatest innovations had been the greatcoat or redingote. This full broadcloth garment was fairly long, with buttoned cuffs and two collars, the lower of which covered the shoulders. The imitation of English fashion introduced into France by dandies such as the Comte d’Orsay led to the wearing of pantaloons, light coloured for riding and dark for evening wear. The influence of military costume showed in all men’s clothing, subjected to the force of reason and aided by the program of official art initiated by Napoleon. By the 1820’s trousers for men were being worn for all occasions. Skin tight and a light in colour for the daytime they did their best to suggest skin, whereas for evening the correct colour was considered to be black. Male guests were required to demonstrate some skill in dancing and to also wear knee breeches and white cravats. For many years they defined a gentleman, as worn here by Conseiller d’Etat Philibert Riviere. They imparted a beautifully virile presence; forcing them to remain erect and keep their head and chin forthrightly forward. From 1815 to 1850 among the influences which shortened women’s skirts but lengthened men’s breeches, which filled out women’s skirts and slimmed down men’s silhouettes. 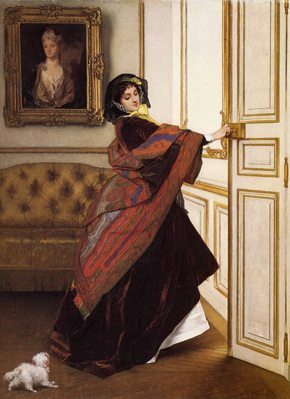 There was an added factor; the return of women from public life under the Empire in France and Europe or the Regency in England to their role as mistresses of their own homes meant that fashion would once again affect costume. 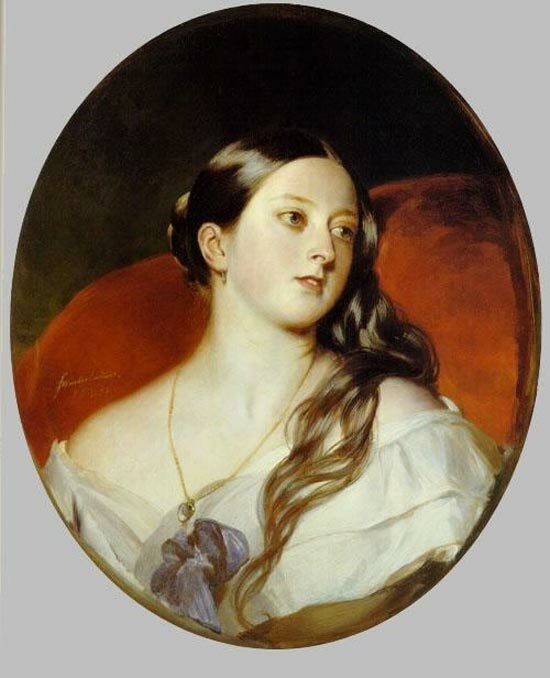 Adelaide was the Queen Consort of William IV of England. The fashion for long chains made from plaited or woven gold wire dates from the 1820’s. Women throughout Europe once more became the guiding spirits of homes in which leisure time was parceled between dancing, reading, perhaps even intrigue. No longer shackled by official duties, the stamped the events of the day with their passion for elegance. From 1825 the Romantic Movement and a new generation that preferred dreams to hard cash influenced costume. They laced themselves tightly and wore wide bell skirts and leg of mutton sleeves. Corsets assisted the silhouette of the Romantic women who liked to show herself in tight fitting riding costume. 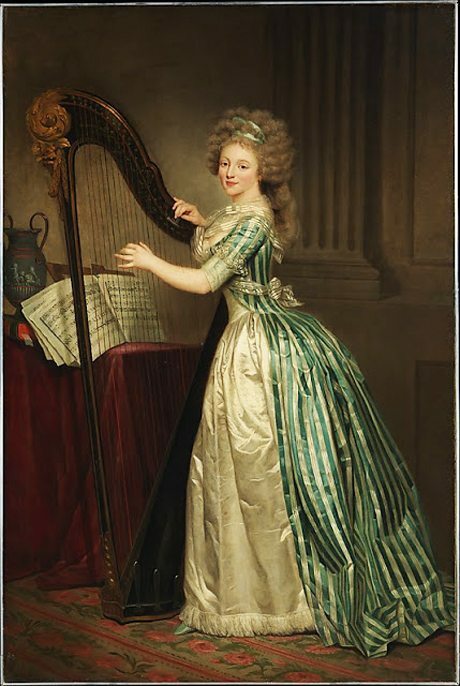 The variety of textiles used included silk, cashmere, crepe, taffeta, tulle, muslin, gauze, velvet or cotton, striped, checked, brocaded, damasked, plain or printed. Textile designers had a heyday and evening dresses and fine linen were finished with hand embroidery. Young beaux wore their buckskin breeches in the morning and black trousers with a plain-buttoned coat in the evenings, the neck covered with a plain or flowered cravat in black silk or madras. Out of doors they draped themselves in wide capes. Liberal political ideas were emerging; an increasingly lively taste for music, poetry, things spiritual and things past marked these new young people as if to counter balance the materialism and mediocrity of an excessively bourgeois class. The young enlivened fashion with fantasy that was often completely wanton and enchanted by the ephemeral. Author George Sand took to wearing trousers as a blow for feminism and publicity. 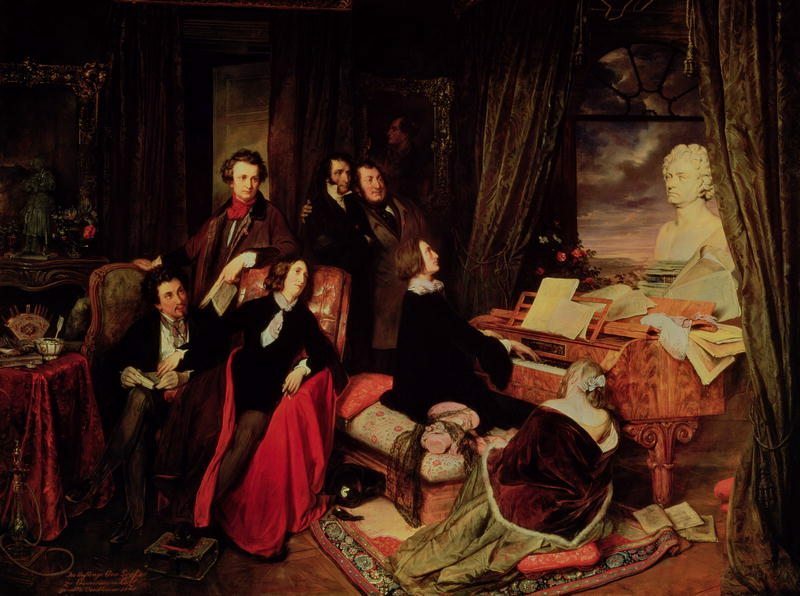 Costume became involved in the battle of the styles while Franz Liszt played blissfully on. Neo Gothic, neo Renaissance styles found their circles of adherents, while aristocrats retained there leaning to the classical style. Ball gowns were worn over voluminous crinolines and had deeply cut necklines that exposed the shoulders. Bracelets were worn on each arm, even two or three pairs at the same time throughout the period. The generous décolletage’s of 1830’s ball and evening gowns encouraged the fashion for large collars worn about the shoulders with diamonds or mosaics connected by chains. Men’s costume was affected throughout the 19th century only by details of shape and colour. It was codified in the increasing number of clubs and circles, some of which became renowned for their elegance. Elegant life demanded style, expensive, artificial, cultivated by the distinguished woman, whether aristocratic or middle class. The new wealth generated by the middle classes around the middle of the century and the easier supply of precious metals guaranteed by the discovery of gold in California and Australia, had a positive influence on the costume industry, which flourished during the second half of the century. 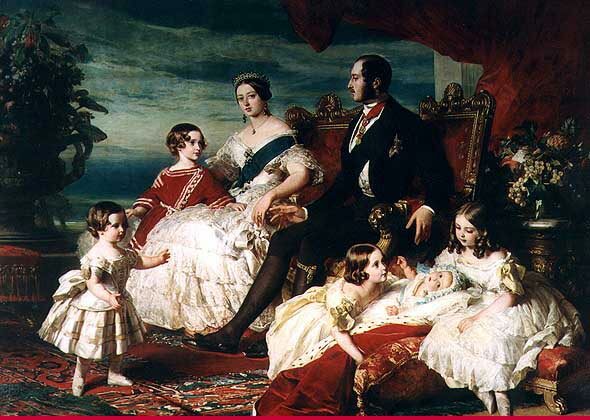 In England Queen Victoria became an important influence on fashion. The court and the rest of society copied her jewels. They were worn in great abundance with intimate jewels of sentiment in great favour. During the 1840’s the world of nature and the Renaissance and Middle Ages continued to provide sources of inspiration on costume and in particular jewellery. Angels, heraldic and architectural motifs were incorporated with elaborate foliage. Naturalism flourished with flower symbolism very strong. Bouquets of flowers set in diamonds were worn as brooches or hair ornaments, decorated with cascades of diamond drops suggesting rainfall. In 1851 at the Great Exhibition in London, Louis Napoleon in France sought to generate a new interest in luxury, sponsoring French firms to exhibit. The tone was set by the court of Queen Victoria and “High Society”, which was exemplified by the great ladies of the demi monde. 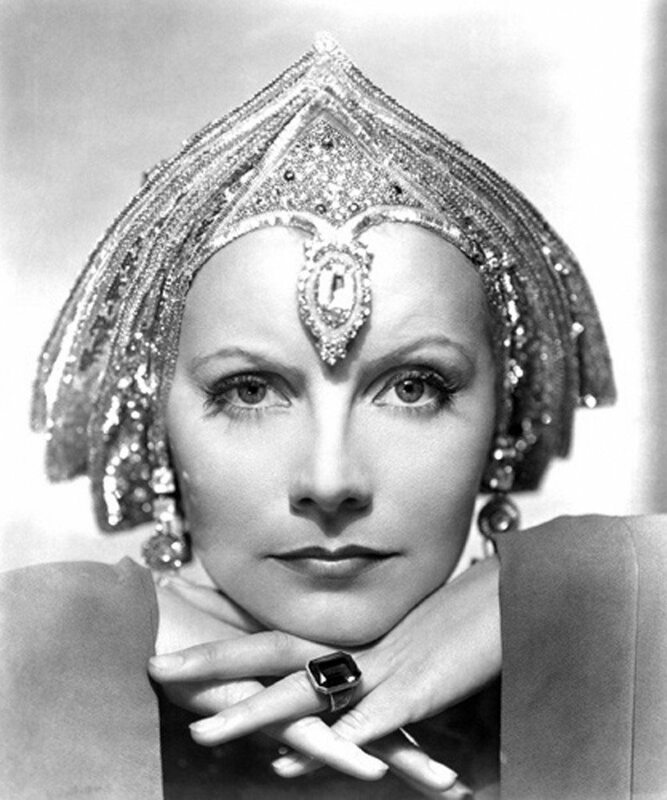 They inspired the most dazzling creations by major couturiers; hats loaded with plumes, chinchilla capes costing a fortune, with self-confident men wearing tailcoats or frock coats and cravats. Between 1860 and 1880 a revival of interest in the Middle Ages and the Renaissance saw a new wave of archaeological influences from Classical Greece and Egypt. Arts and Crafts jewellery with its use of enamel, semi precious stones, baroque pearls and inexpensive materials provided an alternative to flashy diamonds. 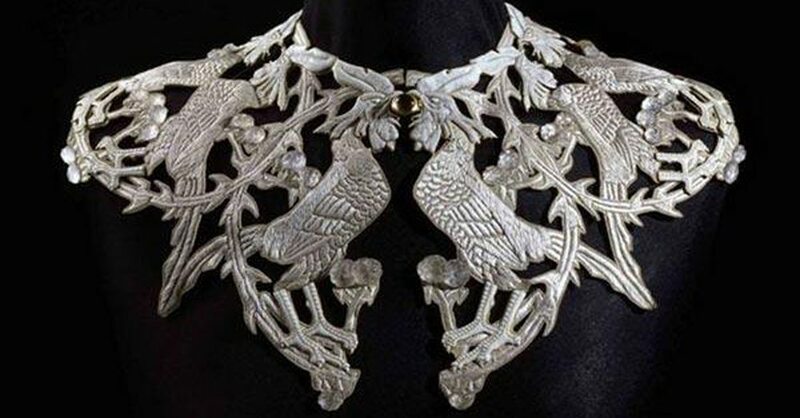 The return to nature and the advent of the style known as Art Nouveau, resulted in jewels of a more primitive and sensual quality, the most imaginative work by Rene Lalique (1860-1945). It was also inspired by the increasing array of oriental artifacts. Naturally, lilies, irises and orchids were favored, although any and every form, from palm fronds to seaweed, offered potential for development into an animated pattern. Insects and birds of color and grace lent themselves to the same stylizing and refining process – dragonflies, peacocks, swallows, or creatures such as snakes or greyhounds writhed there away across Europe depicted on furniture, porcelain, objet d’art and jewellery. And then there were beautiful women with long trailing tendrils of hair, embellishing so many wonderful artifacts. Beauty and innovation were also important aspects of La Belle Époque, the so-called beautiful era, that period in Europe from c1890 to 1914 when France and its European neighbours were at peace. It was a time of great political and social contrasts. At Paris the Cabaret and Can Can thrived and the term ‘Impressionism’ was given to a new style of painting, whose deft brush strokes and lively colors emphasized light in all its changing qualities. Art and design flourished music became accessible to a wider audience and going to the opera meant wearing fabulous jewels. In England the elegance of the Edwardian era demanded jeweled ornament that complemented these halcyon days. Rene Lalique’s designs and styles united poetry, music and the philosophy of life. Like everyone else he was caught up in an arabesque of literature, poetry, music and art, reflected in sensual, poetic masterpieces. Rene Lalique introduced jewellery made of crystal glass like this stunning collar now in the Kremlin museum at Moscow. Following the war the reaction to four years of suffering and privation took the form of a period of exaltation, creativity and joi de vivre. Etiquette changed so conformism was rejected and freedom of expression became the new rule. 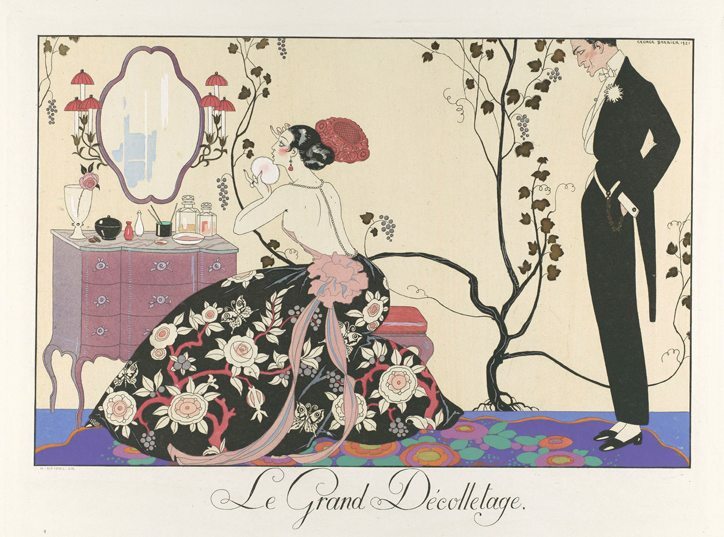 The confirmation of ‘design as art’ appeared in the aftermath of an International Exhibition of Arts (Exposition Des Arts Decoratifs et Industriels) held at Paris from April to October in 1925. World War I profoundly changed the role of women in society. During the years of conflict with men at the front, women were forced to drive ambulances, work in the fields or factories, farms or offices and constricting bodices, long skirts and elaborate hairstyles were abandoned in favour of the more practical and functional shorter dressers and cropped hairstyles. It enabled women to perform their newfound duties with greater freedom. Dramatic social change was accompanied by the emergence and flourishing of a revolutionary style of fashion, design and illustration. Gone was the overpowering opulence of the late Victorian period, and the elegance of the Edwardian times. In its place were the clear, clean lines of angular geometric shapes, refined detailing and super draftsmanship and craftsmanship. Egalitarian ideals were triumphing over aristocratic habits and the invention of the automobile was changing people’s aspirations, ways of life and the costume designed to be worn to live it. Next articleFashion – Is It More Than a Frock asks Carolyn McDowall?